The British Library is planning to expand its presence outside London, with a new base in Leeds and improvements to its site near Wetherby. Proposals for the new British Library North were discussed at a recent board meeting, it has been confirmed. The move would come as part of a wider plan for the library to mark Leeds' year of cultural celebration in 2023. Library bosses are also focused on improving its site in Boston Spa, near Wetherby, a spokesman said. The base in the town is the home of the UK's national newspaper collection, which comprises more than three centuries of local, regional and national newspapers. There is also an extensive haul of books, microfilm, sound recordings and electronic resources. 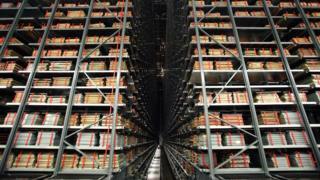 A spokesman said: "The primary focus of our British Library North programme is to invest in the estate on our existing site at Boston Spa, near Wetherby, to expand archival-standard storage facilities for the collections under our custodianship, and to refurbish the staff areas, much of which is outdated. "These plans are now well-advanced and we are in the process of developing an outline business case for renewed investment in the Boston Spa site." Plans for a new British Library North were initially reported in The Guardian on Monday. The spokesman said it was working to expand its culture and learning programme in the run up to the 2023 festival. Plans for a longer-term presence in Leeds after that would be discussed in the coming months, he added. Council leader Judith Blake said the library was important to the "cultural, digital and economic landscape". Mrs Blake added: "Leeds has ambitious plans for making the most of our cultural strengths as we work with partners towards 2023. "We are delighted to have a strong relationship with the British Library... and we look forward to working with them in the years ahead, as one of a wide range of organisations who see the opportunities available here."